It has been a very long time since I have posted on here. However, I intend to continue my weekly updates for all of the college football, as I did last season. As the kickoff of the 2013 season begins in a few hours, here is my pre-season top 25 poll, along with a mini-preview for each team. 1. Alabama - Poised for another title, someone needs to knock them off. 2. Ohio State - They're on their way, but not quite talented enough to knock off the SEC's best. 3. Oregon - Don't expect many bumps from Kelly's departure. 4. Georgia - Explosive offense will be interesting against the tough defense's in the SEC. 5. Clemson - Ready to break away from underachieving stereotype, dark horse title contender. 6. Texas AM - Off field distractions could derail this team, but should be able to contend. 7. Stanford - Could this be the year? Hopes are high, but championship might be out of reach. 8. South Carolina- While youthful, has experience where it matters most. SEC title dark horse. 9. Louisville - Cupcake schedule will help them, but if not careful will get tripped up. 10. Florida State - Appears to be them and Clemson for the top of the ACC. 11. Michigan - Better than most people think, good chance for BCS bowl berth. 12. LSU - Easily could surprise. Don't count them out vs Alabama. 13. Florida - Will need better QB play to get into BCS. Defense will carry team. 14. Oklahoma State - Out of OU's shadow, OSU is ready to take back the Big 12 title. 15. Notre Dame - Won't be as good as last year, brutal schedule once again. 16. Texas - All offense this year, will look like the rest of the Big 12. 17. Oklahoma - Will look to rebound from a down year. 18. UCLA - Looking to take the next step, Bruins could steal a Pac 12 title if it falls right. 19. Boise State - MWC is tougher, and BSU may find themselves unraked when its over. 20. TCU - Will bounce back from down year and could get a share of Big 12 title. 21. Northwestern - After a great 10-win season, should repeat that total this year. 22. Nebraska - Offense is there, will need defense to step it up after late season collapse. 23. USC - A couple years away, but needs 9+ wins to save Kiffen's job. 24. Oregon State - Could pull surprises, but stuck behind STAN and ORE in Pac 12 North. 25. Wisconsin - After sneaking into Rose Bowl last season, will push on with new coach. The college football season is winding down, but the action is only heating up as conference races are becoming more clear. 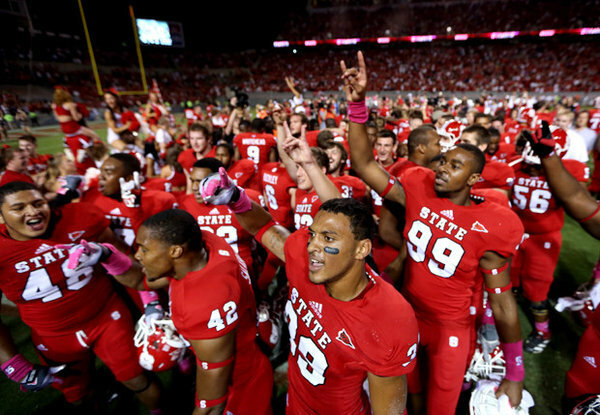 The five bowl-eligible undefeated teams were cut down to just three. #10 Louisville had an ugly loss to Syracuse. The Cardinals were not in much discussion of the national title yet, but the loss derails any hopes of it. A BCS-berth is still in the mix though. But the biggest upset was #1 Alabama's loss to #15 Texas A& M. The Aggies were under question as to whether they could compete in the nation's best conference. They solidified themselves in the SEC with a win over one of the most dominate teams with the win over Alabama. 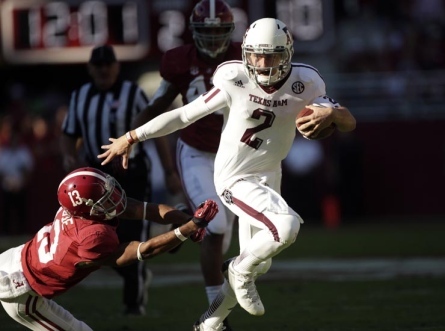 Aggie's freshman quarterback Johnny Manziel's play has given him national attention, but he has had games similar to this one many times this season. Manziel, who was just a 3-star prospect by Rivals.com and Scout.com, has taken college football by storm and has a very bright, Heisman-type, future ahead of him. With the losses by Alabama and Louisville, it leaves Kansas State, Notre Dame, and Oregon as the only undefeated teams renaming Ohio State still is 10-0 but is intelligible for the postseason. It would be very interesting to see how the Buckeyes would be viewed with the other three if they were bowl eligible. But as for the other three, there is no clear-cut decision on who the best two are. Notre Dame has played the toughest schedule this season, and the only tough game left is vs. USC. The Irish have impressive wins over Michigan State, Michigan, Miami (FL), Stanford, BYU, and Oklahoma. But there are some close wins that could hurt them to Purdue and a 3OT win over Pittsburgh. Oregon has the toughest remaining schedule, with games vs Stanford, Oregon State, and Pac-12 South champion. That game will either be vs. UCLA or USC, who play each other this Saturday. Oregon already has a win over USC this year but has not played UCLA. Schedule wise, the Ducks have wins over Arizona, Washington, and USC - quite a few less then Notre Dame. Wins over Stanford and Oregon State, along with a Pac 12 championship win, will close that gap however. Kansas State also has tough games coming up vs. Baylor and Texas. 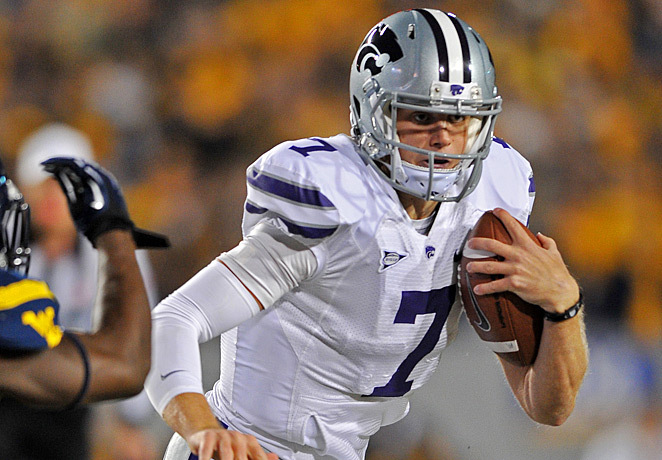 The Big 12 has been brutal to teams, and Kansas State has been the only one to avoid a loss. Impressive wins include Miami (FL), Oklahoma, West Virginia, Texas Tech, Oklahoma State, and TCU. A win over Texas will add to that list. In the end, I see all three of these teams winning out. That is where serious problems arise. All have a good case for a spot in the big game. Oregon is the best team in my opinion, and second is Notre Dame. That would create the best-possible title game at this point. A loss to one of these schools will clear up a lot of confusion, and like what we saw happen to #2 Oklahoma State last year, you can't sleep on any of these remaining opponents. Quietly, the MAC is having its best season as a conference in a long time. Toledo and Northern Illinois are two of the top teams in the conference, and they will have a big clash this Wednesday. A win for Northern Illinois clinches the MAC West division and puts them in Detroit for the MAC title game, and they should clinch that with a win over the Rockets. Rutgers does not have a conference loss this year, and that gives them the small edge over Louisville for the Big East championship. But will that hold? This Cincinnati Bearcats squad is one of the most underrated in the country, and they should drop Rutgers. A loss for USC will ruin all hopes the Trojans have for a BCS-berth, and they desperately need a win here. UCLA has quietly had a very good season, but USC is just too powerfull. They may not have played to their full abilities this season, but they should this week and take down their rival. The two best teams in the Pac-12 North go at it, and Oregon's explosive offense should give them another win on their way to the title game. Stanford will put up a fight, but this one won't be very close. Projections based on predicted team performance for rest of season. The season presses on as we head into week 10 and have a look back on a big week 9. 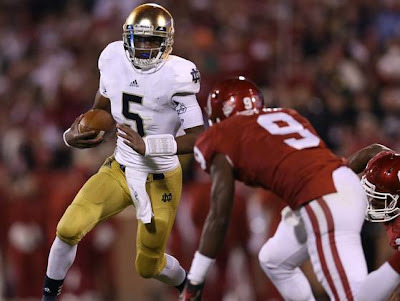 #4 Notre Dame took on #9 Oklahoma and proved all doubters wrong with a very strong showing, beating the Sooners 30-13. The Irish have played the hardest schedule this season, and are now 8-0. There are people, however, that have said they have not played anyone, and their record is a fluke. But the Irish have wins vs. Michigan State, Michigan, Miami (FL) #13 Stanford, BYU, and now have one over #14 Oklahoma. All critics should be silenced, and Notre Dame should win it's next four games vs. Pitt, Boston College, Wake Forest, and #16 USC. Note Dame has the best chance out of the other three undefeated schools with legit title hopes (Alabama, Oregon, and Kansas State), to win out, and they have taken a stake in the national title talks. Former #3 Florida was taken down by Georgia, and could quite possibly ruin the Gator's title hopes. #14 Oregon State was upset by Washington, and the Beavers title hopes are gone as well. I think Oregon State was always overrated, and the high rankings in the BCS and AP polls were way too high to me. The loss brings them back down, and the Huskies get a much-needed conference win. #6 USC lost all their title hopes too to a crushing defeat to Arizona. The Trojans play #2 Oregon this weekend and hope to salvage a spot in the BCS. Mississippi State was blown out of the water by Alabama, and they will look to show they are an elite force in the SEC. Texas AM will try to continue their winning streak. The Aggies will make it close, but Mississippi State is just too good, and will shut down the Aggies' high powered offense. 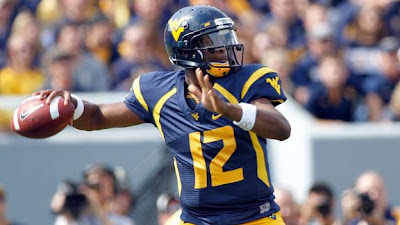 It's now or never for West Virginia to salvage this season, and now or never for Geno Smith to get back into the Heisman race. Smith's season reminds of Baylor's RGIII last year. He started off very strong but abruptly fell off the map, as did his team. But then he came back at the end, won the Heisman, and the #2 pick in the draft. That very well could be the same for Smith this year, and it could start this week. A bye should help West Virginia get the W.
The two best teams in the PAC 12 square off in Pasadena, and the Ducks have a lot to prove as they have been passed over in favor of Kansas State and Notre Dame in most polls. A big win over a down Trojan squad will go a long way. USC has a good chance of a win here, but Oregon has the upper-hand. A rematch of last year's title game - this will be Alabama's hardest game of the season so far, and LSU needs a win to keep their title hopes alive. It should be another low scoring game, but Alabama has a better offense. They also have a slightly better defense, and they should roll over LSU like they did last January. Kansas State has another test vs. a very good Big 12 school. The Wildcats should come away with another win, but we have seen all of the Big 12 beat up on each other week in and week out. It has been hard to distinguish a clear-cut favorite in the Big 12, but a win over the Cowboys could give K-State that label. Don't sleep on an Oklahoma State upset, but Kansas State should win this one. You never know who will beat who in the Pac 12 this year, and aside from Oregon, the Pac 12 resembles the Big 12. Everyone is beating up on everyone else. Arizona is fresh off a huge win over #16 USC, and will try to also beat the Trogan's rival UCLA. The Bruins are a talented team though, and I am calling an upset here. We push on into the college football season, and week eight brought us big games with surprising results. #14 West Virginia was coming off its first loss of the season, a 49-14 throttling at the hands of #19 Texas Tech. This week, West Virginia took on #7 Kansas State, who has shocked some with it's 6-0 record coming in. Geno Smith, West Virginia's QB, has had a great season so far, and came in without a single interception. But it was another rough game for all of West Virginia's team, as their defense was exposed again, and Kansas State won 55-14. Geno Smith threw his first two interceptions of the year. But the real star, who has taken all of Smith's stardom this week, was Kansas State quarterback Collin Klein. Klein went 19/21, with 323 yards, and three touchdown passes. On top of that, Klein also ran for an astonishing four touchdowns on only 12 carries. Klein now looks like the Heisman favorite this week, and Geno Smith has fallen out of the conversation. West Virginia as a team also looks bad, especially its defense. The Mountaineers are in a midst of playing the Big 12's best six teams, six straight weeks. They are 1-2 so far. They have a win over Texas (who is having big problems of their own), but have terrible losses at the hands of #19 Texas Tech, and now #7 Kansas State. Next week it is TCU, followed by Oklahoma State, and #10 Oklahoma. If they do not turn their defense around, which will be hard to do, a 5-5 record after the gauntlet of talented teams is very likely. #8 LSU also had their problems vs #25 Texas AM, and they still look like the fourth or even fifth best team in the SEC. As for the best, #1 Alabama still holds that spot after a big win over Tennessee. Number two though, now is #4 Florida who had a huge 44-11 win over a banged-up #9 South Carolina squad. Florida has a huge test next week vs #11 Georgia, but a win gives them the SEC East. Alabama has game vs an undefeated #16 Mississippi State. Both have some very tough contests to finish the year, but it's looking like Florida and Alabama will face off in the SEC title game for a spot in the national title. Cincinnati was undefeated before an under-the-radar upset to Toldeo last week dropped them out of the polls. This is the same team that beat Virginia Tech and will give Louisville a fight as two of the three best teams in the Big East square off. Louisville can gain momentum with a big win on their way to a possible Big East championship. Florida is fresh off a giant win over #18 South Carolina and a win over Georgia, and with a win here will have beaten the two teams who pose a threat to take the SEC East title. Florida should roll with another big performance. Expect another huge scoring affair but with a little more defense then we have seen recently. Texas Tech is a suprise team this year, and Colin Klein looks to build off the huge game he had last week vs West Virginia. Both schools are under penalty from the NCAA. Ohio State is having a great season with eight wins despite some concerning play thus far. Penn State is on a five game winning streak and looks to take down another Big 10 foe. Ohio State quarterback Braxton Miller should be back after the head injury sufferd vs Purdue last week, and that will be the key factor in the Buckeye's improving to 9-0. The winner of this game will most likely represent the Legends division in the Big 10 title game, unless Northwestern has something to say about it. But Michigan and Nebraska's fate lie in this game. Nebraska has underachieved this year and should slow down Michigan, but I see the Wolverines squeaking one out. It isn't usual to see such a big non-conference game in midseason, but we have one this weekend between Notre Dame and Oklahoma. If you are not sold on Notre Dame yet, this game will do it. The Irish will assert their dominance and continue as a title favorite this year with a huge win over Oklahoma. Mississippi State has a chance to pull the biggest upset in school history, and with this talented team they have a chance. But Alabama is just too good, and intimidation could be a huge factor here. The Tide will roll in a defensive battle. The midway point of the season is past, and the national picture is taking shape as we head into the second half of the season. #5 Notre Dame and #19 Stanford went at it in their annual rivalry. In overtime, Notre Dame went up 20-13 with a touchdown on their first possession. Stanford got the ball to the inch line, and it was 4th and goal. Stanford running back Stepfan Taylor appeared to have been stuffed short, and Notre Dame began celebrating. But when the replays started, it looked like Taylor had gotten the ball over the goal line. After review though, the play stood as called and the Irish stayed undefeated. #4 West Virginia went to Lubbock, Texas to take on Big 12 foe Texas Tech. Most people expected West Virginia to roll over the Red Raiders, but Texas Tech became the first team to shut down Gino Smith and WVU. Smith still didn't throw his first pick of the season, but they couldn't get the offense going. Texas Tech was able to get their going, and blew out the #4 team in the country 49-14. Smith still has remarkable numbers for the season, even after the rough game. He has a 75.3% completion percentage, 25 touchdowns and no interceptions. He still is the Heisman favorite for many people. #12 LSU beat #3 South Carolina, creating more parity behind Alabama in the SEC. #18 Mississippi State is still undefeated, and their match up with #1 Alabama in two weeks will decide the SEC West. But LSU is still close behind. Oregon tries to keep their title hopes alive vs a suprising Arizona State squad. The Ducks are just too explosive, and should roll over ASU. Texas AM has a huge test this week vs LSU, and if they can stay competitive, they can show doubters that they can play in the SEC. LSU looks to build off a big win vs South Carolina, and should succeed in College Station. Virginia Tech has had a bad start to their season and a big upset over Clemson could change that. But Clemson just is too good, and the Tigers should roll over VT.
South Carolina has a chance to get back into the title race after a loss at LSU, and a win over Florida would give them a win over the top two teams in the SEC East. A win for Florida confirms their spot as the second best team in the SEC so far. I think South Carolina and their stellar defense will pull it out over the Gators. Texas Tech was blown out by a powerhouse team a couple of weeks ago in Oklahoma, then blew out a power house team last week vs West Virginia. Can they beat another Big 12 powerhouse? TCU looks to continue their rebound from the Iowa State loss. The Big 12 is giving us big games every week and has another one here. Kansas State is the only undefeated team left in the Big 12, and most analysts had them as the fifth best team in the conference this pre-season behind Oklahoma, Texas, West Virginia, and TCU. Kansas State already have taken down Oklahoma, and have a chance to take down another on their way to the Big 12 title. West Virginia will try to show signs of life after the embarrassing defeat last week, but KSU should win by a small amount. Could see this go either way, however. We're almost at the half-way point of the college football season, and week six wrapped up last weekend. That also included arguably the top upset of the season, as #2 Florida State blew a 16-0 halftime lead to N.C. State, and lost 17-16. The Seminoles still have a shot at the national title, but they took a big blow after the loss. In a completely different game for the Big 10, #12 Ohio State and #20 Nebraska combined for 101 total points, and Ohio State won 63-38. In a down year for the Big 10, it's unfortunate the only team who could compete with other BCS teams is not bowl-eligible. The two disappointments of the SEC this year, Arkansas and Auburn, went at it on Saturday to salvage a conference win. Arkansas rebounded after four straight terrible losses and won 24-7. #18 Florida finally proved they are a legitimate title contender by upsetting #4 LSU 14-6. Florida and #6 South Carolina, who had a dominating win over #5 Georgia, appear to be the only teams in the SEC who can take down #1 Alabama. The SEC East may be better then the West this season. Iowa State pulled the upset last weekend on TCU, and will look to do it again on undefeated Kansas State. Can they pull it off a seconed straight week? Probably not. The Red River Rivalry's 107th meeting features two top 15 teams, but this game might show Oklahoma's weaknesses, and Texas has a good chance to blow out their rivals. No one is quite sure how good they are, and most think they are overrated. Texas could come away with a blow out here - but Oklahoma's defense should keep it close. Notre Dame has played phenomenally these last couple weeks, and has another opportunity to show the country they are back with a win over Stanford. The Irish defense is one of the best in the nation, and should shut down Stanford's offensive attack. Washington has upset USC twice recently in 2009 and 2010. They look to do it again, but USC is better than they have been recently, and they know that one more loss eliminates them from any chance of the BCS National Title. They should roll here. South Carolina demolished Georgia last weekend, but can they beat an elite team for a second straight week? Both the Gamecocks and Florida are trying to take power back in the SEC from Alabama and LSU. Florida has already beat LSU, and a South Carolina win could knock LSU out of SEC contention. The Tigers have looked bad the last three week, and South Carolina should get a huge win for this program. Louisiana Tech is undefeated, and this is where they can prove they could make a push for a BCS-bid. But Texas AM can't afford anymore losses, because once they get deeper into SEC play, the losses will rack up. Week 5 proved to be one of the most exciting weekends of football so far, with upsets and many shoot-outs. #8 West Virginia and Baylor combined for 133 points, and West Virginia won 70-63. Mountaineer's quarterback Gino Smith is having an outstanding season, and he burst onto everyone's radar with his performance vs. Baylor. Smith threw for 656 yards, and eight touchdowns. He had more touchdown passes then incompletions, as he went 45/51. Baylor quarterback Nick Florence also had his own spectacular game, throwing for 581 yards, 5 touchdowns, and one interception. He was also 29/47. But the real hero was Smith, who now is my Heisman favorite. Smith not only has 1,728 yards thus far, and has 20 touchdowns and not one interception. Jaw-dropping numbers. #7 Texas and Oklahoma State also had their own shootout, and it came down to the wire. Texas pulled ahead and won 41-36, and did not fall victim to an upset like I had predicted. Even the SEC got into the action with its own shootout. #6 Georgia beat Tennessee 51-44. In other games, #11 Stanford was upset by Washington on Thursday night. #15 Ohio State and #18 Michigan State had a close battle. Both teams were very evenly-matched, and the Buckeyes won 17-16. #5 South Carolina had troubles vs. Kentucky, and #3 LSU had problems verse Towson. The Big 10's troubles continued, and only four teams are ranked this week. That is not what the Big 10 is accustomed to. To get a better sense of how bad the Big 10 is, Northwestern looks like they will be in the Big 10 Championship. Think of that, Northwestern could be the best team in the Big 10. The Trojans should pick up a big conference win here, against a down Utah squad. A win can get them back into the national scene. I haven't jumped on the Florida bandwagon like most have this season, and this is where they have their first test. LSU has had some close games with Auburn and Towson but should roll here. Florida is not yet back as an SEC-contender, and this is the week LSU exposes the Gators's bluff. Last year Texas Tech upset Oklahoma, and now they look to do it again. The Red Raiders are 4-0, and Oklahoma is coming off a bye week after a loss to Kansas State. The Sooners have looked overrated this year too, and Texas Tech may give them problems. Both teams are coming off high scoring games, but Texas's defense should keep Gino Smith from putting up those kind of numbers again. The argument many use against WVU is that they havn't played anyone. I don't think Baylor is nearly as good as some say they are, and Texas will be the first real test. This is where Gino Smith needs to have a huge game to stay in the Heisman race. Georgia and South Carolina are the top teams in the SEC East, and neither have shown anything this season to show they are better then the other. This could be the only way to distinguish who is the better team, and this one is a toss-up. Ohio State looks to get revenge for its meltdown against Nebraska last season. The Cornhuskers look to show they are the best team in the Big 10 with a win here. Ohio State proved they can play with top teams last week by beating Michigan State, and Nebraska took a while to get going vs. Wisconsin. Could go either way, but Ohio State has the revenge factor, and Braxton Miller is one of the top players in the country right now. The Buckeyes should match last years win total this Saturday. Washington shocked Stanford last week, but Oregon is the second best team in the Pac-12 and is head and shoulders above the Huskies. A lot of points will be scored, but the Ducks will still win by three touchdowns. Will look like Oregon's win last week vs. Washington State.